Strip the thyme leaves from the stems and discard the stems. Using your hands, rip the chives and basil into small pieces or use the knife and cutting board to mince. Pour heavy whipping cream in the mason jar, add salt, and chopped herbs and seal it tight. Shake the jar for about 15 minutes or until the mixture becomes thick and spreadable. 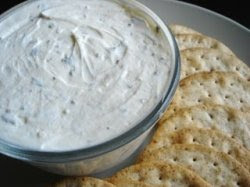 Spread your homemade herb cream onto your bread slices or crackers, or put in a bowl and dip veggies into it.